It would be very helpful if there were shematics listed in the "nerdkit guide" for each project. Would it be possible to make the schematics available for download on the download page?.. Here's the thing-- creating the schematic yourself gives you the opportunity to expand those skills as well. It will also force you to think about things and see relationships that you might not otherwise see immediately until you have more experience. In my all of my years, even going back to when I was a kid and building projects in the 1970's, I've not seen a kit or project yet (ones worth their salt at least) that didn't come with a schematic. Mike has emailed me and indicated that they are working on schematics currently and hopefully we should see some posted on the site as early as next week. OK, here is the basic schematic. Print it out and modify as you wish. ODPS, I have to agree with you fully. While I can totally agree with the learning from the ground up method, in my mind, the ground begins with a basic understanding of what electronic components do WITH the associated schematic. People, please don't take me wrong. I have written the praises of the NK guys and their kit. I have been as strong a supporter on the forums here as my level of knowledge has allowed. So my statements are in NO WAY meant to reduce anyone's impression of the quality of the product or the men behind it. 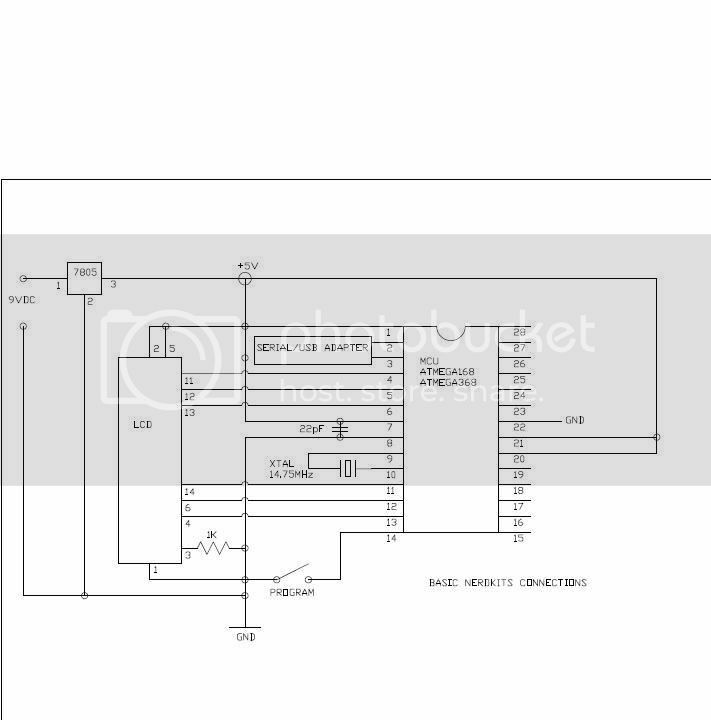 I, however, don't think I would have ever gotten to my current level of knowledge about electronics if the schematics weren't available for whatever project I was on at the moment. How many people had to take a mechanical drawing class prior to wood or metal shop in high school? The schematic is the same. It's the paper representation of the circuit. Now wire by numbers, as used in the NK guide, works as well. The pins being used are called out by definition so people should be ok wiring this way. And I understand this is written to help beginners quickly get a sense of pride knowing they wire up a circuit and it came to life doing what was expected. There are a fairly large amount of people who purchase these kits as I did however who have made it WAY beyond that stage. We purchased the kits to expand our electronics knowledge in the world of micro-controllers. And for those of us who are at that place, schematics are a quicker method for building the circuit and more concise. Personally I had been programming micro-controllers for nearly a year prior to purchasing the NerdKit. I was using a different compiler (Bascom) and an ISP programmer. I had programmed ATTINY2313's, ATMEGA8's, and ATMEGA128's. All the projects I made (other than the one I was developing myself) were built off schematics. I think downloadable schematics in the members area would be great. No need to change the guide other than maybe reference the downloadable content. That way people who prefer them would have access to them. The NK circuitry is very straight forward and the pictures as well as the instructions are pretty easy to follow. Since the various little projects use the I/O in different ways, it really wouldn't help much to go beyond the basic circuit. You gotta remember, this is more educational than functional and even though I have been in the field several decades myself, I am still learning new things like the content here. The forums have become a wealth of knowledge to educate ourselves through our peers and it seems to be working for a great many of us. I hope the schematic above, is useful to some extent as a starting point but AutoCADding up another beyond the basic is actually a bit of work in itself. Take a look on the Members Downloads page -- you'll see a link for "Schematics for 'The NerdKits Guide' Projects". Also, thanks to mongo for his sketch earlier. We'll announce this in our next e-mail newsletter as well. Great guys... Glad to see that... I'm sure these will come in handy for many of your customers. OOPS! I just caught my typo... it's a 368, not a 328. DUH!